Back from Tech-Ed: Can I read your e-books on my iPad or iPhone? Let’s take a look at how the Apple iPad handles our e-books. The Apple iPad has a 9.7″ (diagonal) display with a resolution of 1024×768. There are several applications that can display PDF files available on the iPad including DropBox, an awesome tool for accessing files across various devices including your PC, Mac, iPhone, iPod and iPad. 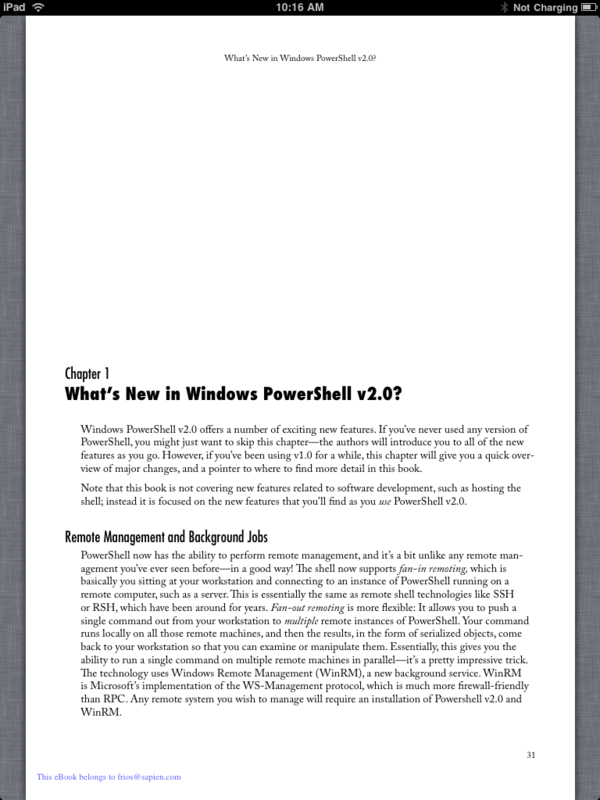 Recently, Apple updated its iBooks e-book reader to display PDF files, and it does a great job doing so. 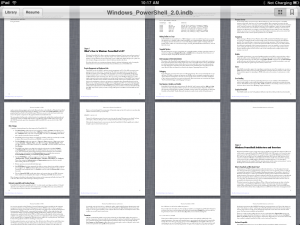 Getting the PDF onto the iPad/iPhone/iPod is very easy. You can simply drop the PDF file into iTunes then sync the device. This places the e-book directly into iBooks. An alternate method is to drop the e-book onto DropBox on your computer. Then open it with DropBox on the iPad. 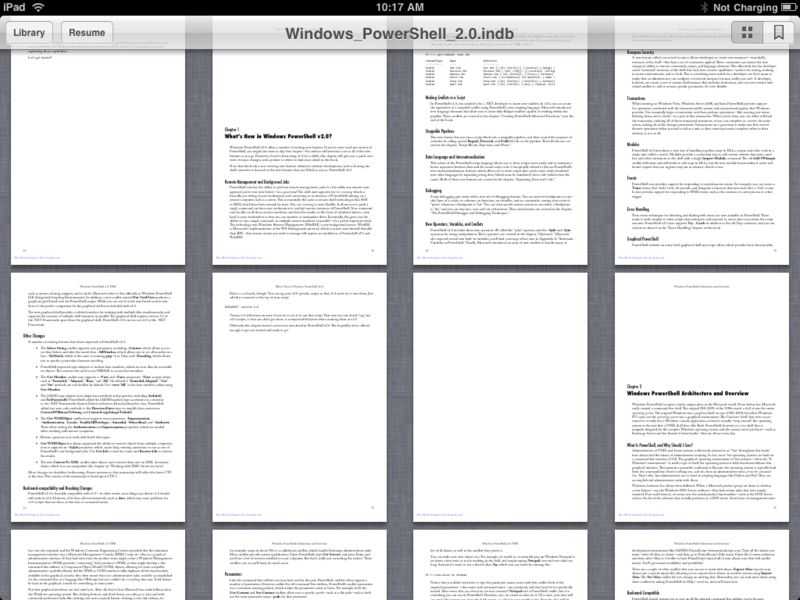 There you can view it either with the DropBox PDF viewer or tell DropBox to open the file with iBooks. 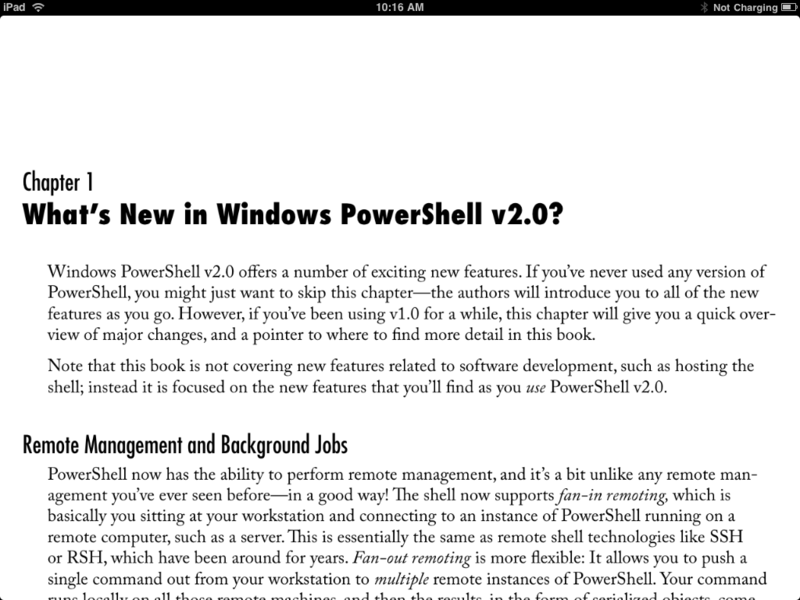 Above is an image of our Windows PowerShell e-book as displayed vertically in iBooks on an iPad. For most people, this is quite readable. For those of you with failing eyes like mine, this is a bit too small. 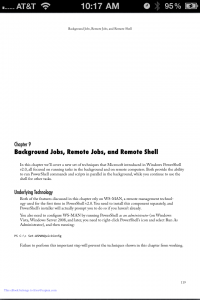 iBooks helps with that by allowing you to pinch-zoom to enlarge the image. Above is a zoomed in horizontal image of the same text as before. VERY easy to read and quite clear! 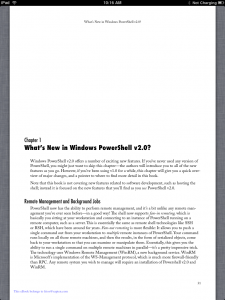 Navigating through the PDF is also quite easy. Moving from one page to the next is done by simply swiping with your finger from right to left, or left to right to go to the previous page. 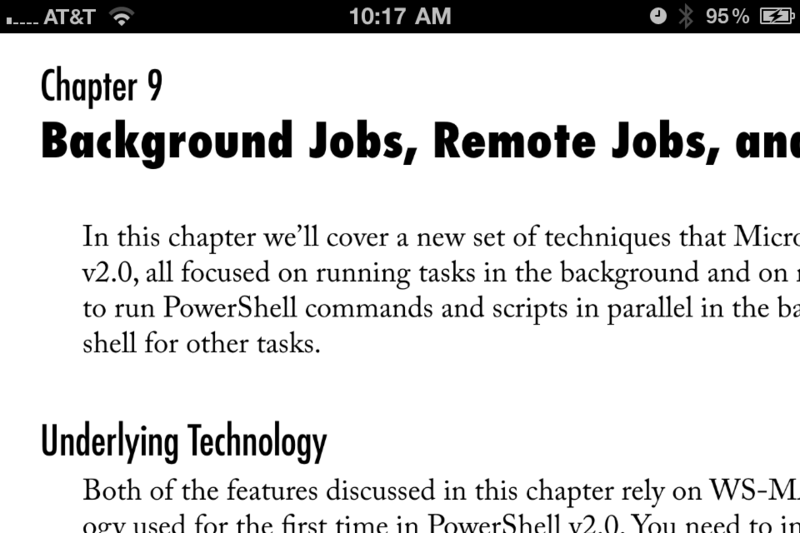 You can also tap the right or left margins to transition to the next/previous page. Tap at the top of the screen and a tool bar pops up with buttons to control brightness, add bookmarks, search and display thumbnails of the pages. Using this feature, you can navigate the thumbnails to the Table of Contents. Display that page and even use the built in hyper-links to quickly navigate to another topic simply by tapping on the topic name! The Apple iPhone 4 has a 3.5″ (diagonal) display with 960×640 resolution. Older versions of the iPhone and iPod Touch have the same size display at 480×320 resolution. 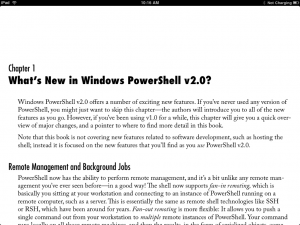 Below is an image of the same e-book as viewed in iBooks on an iPhone 4. This image is quite small, not readable for my eyes. But again, you can pinch-zoom to make it bigger. You can scroll the text around with your finger to view any text that has been clipped due to the zooming. 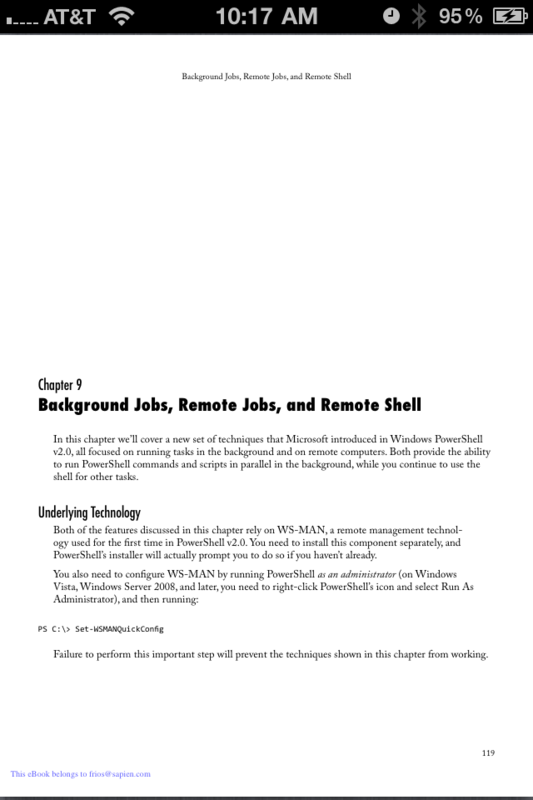 Unfortunately, we do not have the option to change the actual font size in our PDFs. While this would also aid in the reading of the text, it plays havoc with our code formatting. SAPIEN is experimenting with various tools that would help us transfer our PDFs to ePub format (the supported format for iBooks, Sony eReader and the Nook.) Once we can create properly formatted e-books using these tools, we hope to offer our e-books in the ePub format. This would give our users a wide variety of devices from which they can read their SAPIEN Press e-books.